"Picture": The Federal Prosecutor's Office has confirmed the planning of a terror attack by IS for 2016. "For us, the facts in this case were very concrete and also reliable," said Attorney General Peter Frank for the media. Berlin (kath.net) The "Islamic State" (IS) had planned a major terrorist attack in Germany. This was reported by “BILD". According to this, an ISIS supporter has revealed details about the planning of the attacks in an interview with German reporters. The attack should have taken place in 2016, with three teams of assassins traveling to Germany to prepare and conduct a mega-attack. One of the possible goals was a music festival. The Federal Prosecutor's Office confirmed the terrorist plans. "For us, the facts in this case was very concrete and reliable," Federal Attorney General Peter Frank told media. No word as to why it was aborted. In Bessheim, Hesse, there jas been a bloody attack between two relatives. A 23-year-old Afghan injured a pregnant woman with a knife. A heavily pregnant woman was attacked in Bischofsheim in the district of Groß-Gerau in Hesse with a kitchen knife and seriously injured. As a police spokesman told FAZ.NET, the quarrel between a 23-year-old Afghan and his 38-year-old niece escalated. The alleged perpetrator is supposed to Have then fled, but was be arrested a short time later by the alarmed officials. The background of the dispute is still completely unclear. The victim was taken to the hospital with serious injuries. According to the latest information, her condition is stable. The unborn child was unharmed by the knife attack. Edit: now it looks like the perp was a German native without an immigration background, according to authorities. Still, the authorities have a stake in him not being so, don’t they? It also appears he had connections with right wing extremism. A VAN has rammed into crowds of pedestrians in the western German city of Munster killing four people (Now it’s 3) and leaving dozens injured. The driver is believed to have killed himself in the seconds after the incident which police officials have suggested could have been a terror attack. According to reports the vehicle, described by some witnesses as small truck, rammed into crowds of people who were sitting near the Kiepenkerl statue in the old town. Many of the victims were sitting outside the restaurant enjoying the sun when the van ploughed into them. Edit: Imagine my shock. You would think that Marx's big push to legitimize mortal sin would make him and his confreres MORE, not less popular. Germans consider television more trustworthy than the Catholic Church. In a survey, it is only in the rear midfield among 26 institutions. Trust in the pope also decreases. Statistics | Bonn - 04.01.2018 According to a survey, Germans do not trust the Catholic Church with great confidence. Among 26 "non-political institutions," the Catholic Church in a study by the opinion research institute forsa for the television station RTL and ntv is only ranked 18th At 27 percent, however, it improved compared to the previous year by one percentage point. Here, the perception in West and East Germany deviates strongly from each other. For example, only 13 percent of East Germans give their trust to the Catholic Church; by contrast, 30 percent among the West Germans. The Protestant church increased by two percentage points to 48 percent, ranking it in 13th place. In West Germany, 50 percent of the respondents trust them, in eastern Germany 34 percent. Confidence in the pope, on the other hand, declined significantly last year. He is trusted by 54 percent of the respondents, which represents a decrease of 6 percentage points compared to 2016 and means 9th place in the current ranking. Here too, West and East Germany deviate strongly from each other. The pope enjoys, according to the data, 40 percent of the East Germans' trust, but 57 percent of West Germans. The strongest loss of confidence was recorded by Islam. It fell in the "trust ranking" from 25 percent in the previous year to 9 percent. That means rank 24. Behind it lie only managers with 6 per cent and advertising agencies with 5 per cent. Forsa boss Manfred Güllne believes Islamist attacks are responsible this low value for Islam. 37 percent of the respondents trusted the Central Council of Jews, three percentage points less than in 2016. The "trust ranking" is headed by the police, universities, doctors and their own employers. The media in the form of radio, press and television had each suffered 4 percentage point losses. According to the poll, 56 percent of Germans trust in the radio (8th place), the press comes to 40 percent (15th place), the television 28 percent (17th place). HAMBURG. Allegedly left-wing extremists have threatened the AfD faction in the Hamburg Parliament with an anthrax attack. On Wednesday, the faction received a threatening letter with a bag containing flour. The letter read: "G20. Bag content today: Flour. On July 7th, And 8.7. 2017 Anthrax. "According to information from JUNGE FREIHEIT, other factions in the Parliament have also received similar threats. On the two days, the G20 summit will be held in Hamburg, where US President Donald Trump will also be expected in Germany for the first time. The President of the AfD Group, Bernd Baumann, sees the threat as a new dimension in political debate and a low point of political culture." Extreme Left terrorists are afraid of those who think differently and threaten them with the deadly substance Anthrax," he complained. Cologne (kath.net) In the topic of abortion, Stephan Holthaus has charged politicians and especially the CDU of a "capitulation before the Zeitgeist". Holthaus is a rector of the Freie Theologische Hochschule in Giessen and a professor of Christian ethics and apologetics. He spoke at a discussion in an Lutheran Freikirche in Cologne, which was also attended by deputy CDU chairman Armin Laschet. The Protestant "pro media magazine" reported on this. "100,000 abortions a year are an ethical catastrophe. I can expect that a political system that inscribes a Christian human image on the flag will protect life. "For him," it is not conceivable that the CDU has nothing to say." Although abortion is a punishable offense, the actual impression among the citizenry is that abortion is legal. Holthaus demanded that politicians should speak more clearly about the fact that only a small percentage of abortions would be carried out because of problematic pregnancies. In addition, said Holthaus, according to the "pro media magazine", they should support the policy initiatives that accompany women in conflicts during pregnancy. Laschet replied that his state did exactly that, he then criticized the fact that the Lutheran Church did not have a clear position here. Laschet had previously appealed to the participants to participate politically: "There are too few Christians in politics. It is good for the entire political spectrum that Christians engage. "It is conceivable to actively participate or at least choose to go." [Junge Freiheit] One and a half years after the escalation of the refugee crisis, more and more books appear, illuminating the background and consequences of the events. Robin Alexander just landed with his book "Die Getriebenen" the political bestseller of the year. In this book, he succeeds in chronically reevaluating the dramatic sequence of the opening of the border in September 2015, thereby laying bear the motives and failures of political leaders. Now another book catches attention: "Inside Islam". Here the ARD journalist Constantin Schreiber went to the Friday prayer in 13 mosques to find out what is actually preached to Muslims in Arabic or Turkish. Schreiber summed up anxiously, the Imams preached against the integration efforts of the German state. At the same time, to be Muslim and Democrat were to be completely ruled out. And it was partly "harshly agitating against the Yezidis, the Armenians and the Jews," writes Schreiber. A recent incident at a community school in Berlin confirms the massive problem of anti-Semitism rampant among Arab and Turkish youths. A Jewish family, after repeated verbal and physical attacks on her 14-year-old son, saw no choice but to take her child from school. Three quarters of the pupils at this institution, which is engaged in the project of a "School without racism", have a migration background. The fact that anti-Semitism is nowadays no longer "from the midst of German society" but from Muslim immigration, is a dilemma for leftist politicians and journalists. Some media, such as Spiegel Online, conceal the ethno-religious backgrounds of the perpetrators in their reports about crimes. But we do not get any further. The facts must be on the table. Some of what Constantin Schreiber excavates in "Inside Islam" sounds alarming. That Christians have forgotten to see themselves committed as believers to a mission is a problem of Christians, not the Muslims. The fact that sermons invoking fervor of the faith, is sorely lacking among pastors. What is dangerous is the call to hatred for the other believers and the state. Here in Germany, half a millennium ago, in the Thirty Years' War, we had to learn secularization through bloody religious conflicts, constitutions, and the rule of law. It has taken centuries to live with confessional opposition among Christians. Uncontrolled immigration of Muslims makes integration into a task that is no longer manageable in a quantitatively simple manner and is thus a program for civil war. Finally, politics should take heed. Schwerte. Several unknowns have attacked a family father in a train in Schwerte, North Rhine-Westphalia, after he was trying to protect his two little daughters. The attackers were "two to three men with an obvious migration background," said a police officer to a query by Junge Freiheit. The father, with his wife, his son and his two daughters, were on a Saturday afternoon excursion on the regional railway 53 in the direction of Schwerte, when an unknown attacker tried to place his two little daughters on his lap. When the 39-year-old Schwerte resident was talking to the men, they beat him abruptly. Even as he was lying on the ground, they beset him, according to the police. "When his 13-year-old son and his wife guarded him, they were also injured," the police said on Monday. The Sacred Heart of Jesus Seminary of the Priestly Fraternity St. Pius X now transmits Holy Mass and the daily Breviary Prayers as an MP3 stream to the Internet. Between the prayer times, there will be pre-recorded lectures. For a rough orientation when and what is downloaded, the pages help: Mass times and life in the seminaryy of the seminary web page. It would be helpful if a program of the channel were on the home page of the seminary. The address of the MP3 tag is: http://horbau.no-ip.org:8000/rhj . The talks will be in German. BERLIN. [Junge Freiheit] The asylum crisis cost the Bundesrepublik 21.7 billion euros last year. This is evident from the monthly report published by the Federal Ministry of Finance on Friday. For this year, € 21.3 billion has been earmarked for the national budget. For the reception, registration and accommodation of asylum seekers, the federal government spent 1.4 billion euros, for integration services 2.1 billion and for combating the causes of flight 7.1 billion. Social benefits of the federal government cost another 1.7 billion euros. As a direct relief, the federal government also provided the federal states and municipalities with 9.3 billion euros. "More than 90 percent of the federal expenditures," says Ferdinand Fichtner, the economic researcher of the German Institute for Economic Research (DIW), have, however, continued into the economy, such as the spending of refugees for foodstuffs and other consumer goods, rental payments or construction investments. "This can also be described as a huge economic stimulus program," Fichtner told the news agency Reuters. In 2015 about 890,000 asylum seekers had come to Germany, 2016 about 280,000. According to the report, "high entry rates" were limited to the year 2015. The Ministry points out that on paper, in 2016, the Bundesrepublik could, for the third year in a row forgoing new debts and still keeping in the "black" with the budget. A surplus of 6.2 billion euros had even been achieved. This was due above all to the high tax revenues and low interest rates. LEIPZIG. The police in Leipzig on Thursday proceeded with a large operation against the organized crime. More than 500 police officers and revenue officials searched offices and apartments throughout the city. Roads were blocked because of the bust. The mission lasted until the evening. Because of the measure was a decision of the district court of Leipzig, said Bild citing the State Criminal Office of Saxony representative, Tom Behrend. The proceedings were concerned with the infringement of weapons violations and the suspicion of tax evasion. Junge Freiheit] HAMBURG. Despite a large police presence, Hamburg has again suffered several sexual assaults during the New Year's Night. By Monday afternoon, the police had charged 14 wuth crimes for these offenses. Ten suspects had been identified. According to Bild-Zeitung, there were "three Syrians, three Iraqis, two Afghans, an Eritrean and a German-Russian". The remaining perpetrators are not described as being from southern countries, Arabs or North Africans. The main locations were the Grosse Freiheit the Jungfernstieg. As on New Year's Eve 2015, women were sought out by groups and groped. At the beginning of the winter, there were a number of incidents, which according to police, "involved people with an immigration background, who were dealt with on the spot by police officers." (Berlin) Nice is Berlin, Berlin is Nice. The balance of twelve deaths and 49, some of them severely injured, of the Islamic attack attempt on the Christmas market on the Breitscheidplatz near the Berlin Kaiser-Wilhelm-Gedächtniskirche brings the multicultural and interreligious back to reality. The civil society compulsion of self-abandonment and self-expulsion, which was raised to state-rebelliousism, had suffered shipwreck, as was foreseen. The assassination attempt of Berlin is only the terrible epilogue of this failure. In Ankara the Russian ambassador was recently shot. The assassin was precise and ice cold. He acted professionally because he had been trained as a policeman. In Berlin, on the model of Nice, a truck raced into a peaceful crowd. Whoever should fall beneath the wheels would be killed. But the intended were Germans, Christians, Europeans. The assassin had the target in his visor with his hand on the steering wheel and foot on the accelerator. The assassin was a "refugee" from Pakistan or Afghanistan, according to the Federal Ministry of the Interior. But not even now, politicians and the media lack the courage and the decency to put the word "refugee" in quotes. The Polish driver of the truck had previously been shot by the assassin. The "nightmare," which has come true, now speaks of those who have hitherto done little to prevent it. The new migration of peoples must be accepted, there is no deviation from that, the mantra of insistent brainwashing, which is accompanied by thought-control and verbal prohibitions, in order not to miss the desired effect. Within such a narrow framework, the state contented itself with the attempted maintenance of internal and external security, which is more than justified, as Berlin proves. And as other attacks have already cruelly proven, even in Germany. The politics and the exclusive opinion makers do not want this. This has a name and it is called denial. Germans, the Austrians, the Europeans are going to have to accept the "challenges of a multicultural society". Terror attacks, murder and manslaughter have been regrettable but inevitable collateral damage for the "big project". This is not a random joke or an verbal gaffe, but a deliberate plan in which a heterodox alliance has emerged at an early stage, which, although acting for various reasons, with different interests, dissolves European peoples, deprives European states of their sovereignty, undermining the rule of law and jeopardizing security, in short, undermining the community. What is meant is the policy that redefines the German people to the population, eradicates the word nation from their language habits, makes the family defenseless, and wants to reduce Christianity to a social union. The statement is freely transferable to all other "Western" European peoples and states. In the face of such a coo-coo idea like the "big project", citizens are increasingly wondering how their European homelands could exist so far without "diverse colorfulness". And yet, they have existed, and without exception, without fear of the women and girls venturing out into the street, without fear of the family fathers visiting with their children in a lively place like a Christmas Market, without giving whole zones over to the police and state. Why all this? Why are we doing this, Mrs. Merkel? This question is also addressed to the Greens, the "Immigration Party" par excellence, to the columnists of the editorialists, the leading representatives of the economy, and the state-acclaimed cultural blinders, whose independence goes, at best, only as far as the edge of their own bed. "Is this fun to you?" Wrote a Syrian Christian, after hearing of the terror attack in Berlin, referring to the Berliners, the Germans, the Europeans in general. His words are an accusation and an expression of disappointment at the same time. He had to flee from Syria, but did not strike out on the road to Europe, and could not understand how Europe opens the doors to those who are to blame for his fate. The coming Christmas festival is now overshadowed by the bloody terror attack on Berlin. Even more unbearable will be the cloying speeches of the politicians and the media commentators who will explain to us in their devilish way that the tragedy is "irreversible", that we should "endure" (for what? ), and this will all be garnished with the words of a farcical language such as "civil society" (the "axis of the good" will at least hopefully be sought out), "tolerance", "kuntibunti [color culture]", and "inclusion". False because the premisses are wrong, because the overall project for which these words are used is absurd and has always been absurd. The fact is that Germany is importing the problems and conflicts of the world through its immigration policy. No one can credibly explain the reason why a state and a nation were to do such a thing. The people were never asked, and the state was usurped by those who were merely representatives of the people and not self-sovereign state proprietors. People were presented with beautifully wallpapered ideologues. The media company made it possible, the Internet has restored a free space. The wallpaper has long since blown off, revealing the cheap decoration of a movie theater, a fake. But who wants to live in a Potemkin village, who always wants to think about reality? parties. Trump says what the facts are: the murder of Christians is a certain aim of the Jihad. In Nigeria was in Nice as in Berlin. reported against Christian refugees in German asylum centers. The majority have been victims of Muslim "fellow refugees". 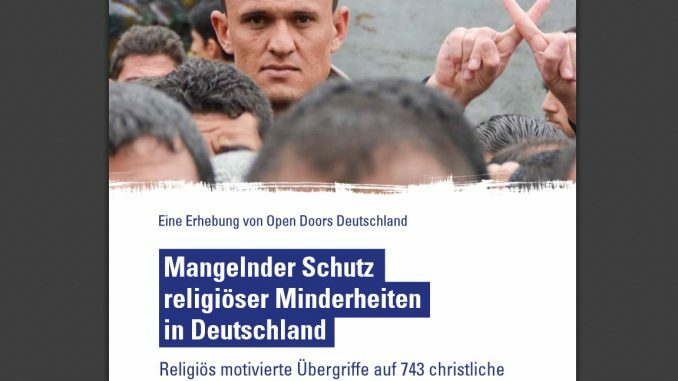 (Berlin) The Fund for persecuted Christians Open Doors Germany put together with other aid and human rights organizations report the refugee " Lack of protection of religious minorities in Germany " before. This religiously motivated attacks on 743 Christian refugees are documented and analyzed in German refugee centers. The report quoted German Interior Minister Thomas de Maizière with the words: "We have underestimated the importance of religion." The Minister was moved to these words in retrospect on the events of recent months. The consequences of these findings is reflected "especially in the German refugee centers," says Open Doors. Through the concealment of these facts, has led to many "wrong conclusions" about the reasons there are many attacks directed especially against Christians, which has led to the "neglect in refugee centers" which fails in the protection of non-Muslim religious minorities from Muslims. Last May, various aid and human rights organizations have come together, "to draw attention to the clustering of attacks against Christians and other religious minorities in German refugee camps and to demand effective protection measures for them." 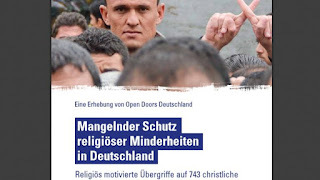 The aid and human rights organizations include the Action for Persecuted Christians and Needy (AVC), the International Society for Human Rights (IGFM), Kirche in Not , Open Doors and the Central Committee for Oriental Christians in Germany . At a press conference on May 9 in Berlin, reports of 231 refugees were submitted reporting "of the massive discrimination, death threats and violent attacks, which refugees in Germany suffer because of their Christian faith." This first collection was continued by the participating organizations. The result has now been submitted to "significantly extended data base". "The documented cases demonstrate the continuing unacceptable situation of Christian refugees who are discriminated against, beaten and threatened with death in the German refugee centers as a minority, by Muslim refugees and partly Muslim employees (security guards, interpreters, assistants). Even ten refugees of the Yezidi faith participated in the survey. Their information has been evaluated separately in this report." Among the 231 Christian refugees whose negative experiences were documented, 512 more cases were added in the months from May to September. In 743 cases there were religiously motivated attacks against Christians, in ten cases against Yazidis. All attacks were carried out in asylum facilities in the Federal Republic of Germany. The distribution of those affected shows Berlin with 146 assaults at the top of the negative scale, while in Saxony no assault was revealed. Of those, there were 314 reported death threats, 44 of sexual assault, 416 of bodily injury. In addition, 615 cases of "other persecution". 83 percent of these affected indicated that "several times" there were assaults. The Christian refugees are "used to being treated as second-class citizens" in majority Muslim homelands. Now they see that they too can find in Germany no effective protection and reporting the violence and death threats to the police have no consequences for the perpetrators, since the Muslim perpetrators are in the majority, and often make counter charges." In homes and refugee centers in many cases it is not the perpetrators but the victims who are perceived and accused of being "troublemakers". "Lately we are seeing it more and more that Christian asylum seekers are concerned with house bans, because they interfere with the supposedly good coexistence in the homes." A majority of the surveyed Christian and Yezidi refugees, therefore, are hoping for "separate accommodation". Several also asked for "no Muslim security personnel". The overall impression: Muslims are more welcome than Christians or members of other religious minorities in the "Refugee Welcome"-- apparatus. Emeritus in Seewald-book: he had great doubts about whether the Church-tax system as it is now, is correct - "The automatic excommunication of those who do not pay it, in my opinion, is untenable." Rome (kath.net) Pope Emeritus Benedict XVI. has discussed in his interview book "Last Testament" about "the church-tax in Germany" in a Peter Seewald interview tape. He had great doubts about whether the church tax system in its current form is correct. Benedict XVI says: "But the automatic excommunication of those who do not pay it is, in my opinion, untenable." The book was published on Friday. The Catholic Church in Germany is seen by Benedict XVI. generally in a critical light. "In Germany we have this established and highly paid Catholicism, often with employed Catholics who then confront the Church with a labor union mentality." The Church is just an employer for these officers, of which they are critical. For the Church in Germany is at a great risk that "a surplus of nonspiritual bureaucracy" arises through the many paid employees. "I am saddened at this situation, the excess of money, that is yet again too little, and the bitterness that comes of this, that malice, which is manifest in German intellectual circles." The readable introduction by Peter Seewald of his interview tape Pope Benedict XVI. is now available on kath.net in full length! The result of state elections in Mecklenburg-Vorpommern is a slap in the face for the policy of Chancellor Merkel. One year after the opening of borders in Germany and the "We can do it" mantra of Angela Merkel, the decision of the voters was clearly determined in the northeast for a federal policy issue: the asylum policy and the influx of illegal immigrants to Germany. According to initial projections, the CDU is falling to third place with 19 percent of the vote and thus was one of its historically worst election results. The party was outclassed by the AfD, which will move from the state with 21 percent in the state legislature. Equipped with the incumbency of the popularly respected Prime Minister Erwin Selle, the SPD held 30 percent, but lost also about 5 percent. Noteworthy is the increase in turnout by as much as ten percentage points from 51 to 61 percent. After years of steadily declining participation, there are significantly more citizens going to the polls. The reason: Obviously, the start of the AfD has contributed significantly to the idea that citizens again have the feeling they have real political alternatives to vote for. The success of the AfD is a success for democracy. Whether euro crisis, asylum chaos, national sovereignty or direct participation of citizens - at last it is not only in back rooms or social networks but that political decisions and decision-making are taking place in the place of a republic, namely the Parliament, to fight again with real pros and cons, which has you nothing to do any longer with an absurd all-party coalition. With this election result the triumph of AfD continues. It's all the more remarkable, since the party had to contend with massive discrimination and violent attacks by left-wing extremists. Upon the elections for the Chamber of Deputies in Berlin in two weeks, the young party founded only three years ago is expected to move into the tenth state parliament. The established parties but also journalists in the mainstream media of the country must now accept that Germany has experienced the long overdue normalization of its political landscape. The governmental tutelage of citizens by a political class now comes to an end. We are experiencing a positive re-politicization of society, the emancipation from a far left liberal dominated public opinion. And that's good! "Whoever speaks openly as convert to devout Muslims about his faith and does not hide his cross, is not safe even in Germany." Maintal (kath.net/ idea) An Afghan Christian (31) has been attacked in Maintal (near Frankfurt) by four Muslim Afghans. They are to have shouted "Allahu akbar" (Allah is great) and they wanted to kill him. This was announced by a volunteer of the Evangelical Free Church (FeG) Hanau, Benjamin Dauth (Maintal), with the Evangelical News Agency idea. The Afghan - his name is known to idea, however, not mentioned for security reasons - visited the community worship and worked as a volunteer translator in a refugee camp in the city. The attack occurred on the evening of 17 August. While getting on his bike, the Afghan Christian was outside his apartment, an Afghan tried to prevented him. He is said to have been with three other Afghans who had been hiding earlier whom he called out, that this was the "opportunity." Then, to have punched and kicked him all four while shouting "Allahu akbar." The victim tried to pull away. Then to one of the Muslims shouted "kill him!" One of the attackers then is to have pulled a knife and tried to attack the Christians. At this point several residents had come outside because of the noise. The police arrived a little later, says Dauth, and have got the three attackers' personal details. The fourth had, however, escaped. At the hospital, bruises on the shoulder, forearm and face were found on the Christian. According to Dauth it was the third such attack on Afghan Christians. The situation is particularly difficult for him because he had converts from Islam to Christianity, "Who speaks openly about his faith as a convert to devout Muslims and does not hide his cross, is not safe in Germany. "The Afghan Christian is still in the asylum procedure and has worked for a temporary employment agency. Three of the four attackers are housed, according to the victim in the refugee shelter in Maintal, in which he himself has worked as a translator. The fourth is allegedly living in Darmstadt. As Dauth further said, other refugees from the Maintaler housing facility had warned the Afghan Christians of an attack. The Muslim Afghans had talked about it in advance. Police are investigating according details frim Dauth, for grievous bodily harm. idea asked the police on 26 August for an opinion. They want to address the incident "early next week. Whoever speaks these days about Berlin has to talk about terrorism. Cars have been burning daily for weeks, police officers are attacked and shop windows of businesses and politicians offices are repeatedly destroyed. Yes, that's terror. What else would it be? That national media and federal politics, if it ever addresses the issue, does it just as a side note for a simple reason: The perpetrators are left-wing extremists. Wearing disguises and armed with stones, paint bombs and explosives, they track each night throughout the capital. A "black July" was announced with attacks on police officers and all "beneficiaries of the prevailing logic" by terrorists from Riga Street. "As much as you can take is what's allowed!" This is the provocation to the citizens of the city. They are the ones who have to co-finance the terror of dubious "democracy programs" and in the "fight against the right". But Berlin would not be Berlin if the hatred of the Left was not at least combined with stupidity and insolence of the politicians in charge. Berlin's mayor, has now called for a "de-escalation approach" something like the quintessential Berliner slum factor. Yes, even talking with the left-wing extremist scene. This should break the "spiral of violence." Went even further the domestic policy spokesman for the pirate faction in the Berlin City House, Christopher Lauer. His logic: give leftist extremists their squat, then they will stop the violence. A thought experiment is enough to understand the bizarreness of these proposals. What would Lauer and Müller do if right-wing extremists or Islamists occupied a Berlin trolley and daily attacked policemen and set cars on fire? But would be what's going on. At least inside Senator Frank Henkel (CDU) has recognized this and just drawn this comparison.Just help the Berliners with this little hindsight. For years, the excesses of the left-wing scene was downplayed, ignored, relativized or even celebrated. No, Berlin does not need a de-escalation concept and no ominous "civil society". Berlin needs a war on terror.